The HTC Legend simply looks stunning. As already noted, its unibody-style aluminum casing makes it look a like a cousin of Apple’s Macbook range of laptops – a good thing – and also means it’s rock solid. Gone is the snap off battery cover, and instead the phone opens up at the bottom where the battery slots out. It’s quite an elegant solution. The capacitive touch screen remains 3.2 inches (320×480) but this time it’s AMOLED, which looks stunning indoors and performs OK outside in sunlight. 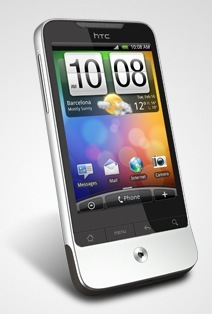 It’s very responsive too, on-par with the best of class iPhone. Overall, the Legend feels snappier in performance than the Hero, even with the latest firmware update, and this maybe due to a slightly faster processor (600MHz vs 528MHz), with an increased amount of RAM (384MB vs 288MB). The Legend also runs the latest version of Android – 2.1. – compared with the Hero’s 1.5. The other major hardware change of the Legend is that it has an optical trackpad in place of the Hero’s trackball. It seemed fairly responsive without being overly sensitive and, like the Hero’s trackball, enables the phone to be operated for the most part one-handed, if needed. We often refer to HTC’s Sense as a custom User Interface built on top of Android, when in actual fact it sits somewhere in between a nicer theme and additional applications for Android, and an alternative UI. At the heart of Sense is HTC’s homescreen widgets, which can run alongside Android’s standard widgets across any of the Legend’s 7 revolving homescreens. Newly introduced is the Friend Stream widget, which aggregates and gives access to your Facebook, Twitter and Flickr friend updates. Clicking through to the full Friend Stream app enables you to filter updates by all, status, images, and links. You can also, of course, update your own status across Facebook and Twitter, as well as reply or comment. Overall, it’s a really nice addition. The other available widgets include: Music, Weather, Bookmarks, Calendar, Clock, Footprints (HTC’s own GPS-powered location-based service), Mail, Messages, News, People (contacts), Photo album, Photo frame, Search, Stocks, Sync All (a one-click way to update all of the web services that HTC Sense/Android supports), and Peep (a Twitter client that is a little redundant with the addition of Friend Stream). The Legend also introduces a new way to quickly navigate across the phone’s 7 homescreens, which can be optionally packed full of widgets. A pinch on any homescreen, zooms the user out to reveal a very OSX Expose-style view of all of the homescreens. Tap on the desired homescreen and you zoom back in. Nice. 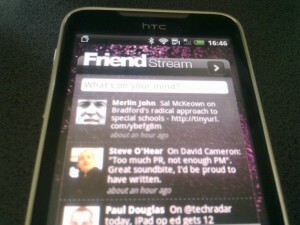 Social networking integration, aside from the new Friend Stream widget, has also been further developed. As well as creating a unified address book, pulling in and merging contacts from Google, Facebook, Exchange and Flickr, the Legend’s contact app offers a feature called ‘Online Directories’. This enables you to browse the profiles of your contacts on Twitter (and view tweets, unfollow etc), and the other various social networks and web services that Sense supports. It’s pretty cool. A couple of other software improvements that are worth mentioning. The Legend’s web browser is a lot faster than the Hero’s, which in my view, aside from speed, was probably the best out there. Pages render fantastically, including re-flowing text to eliminate any horizontal scrolling, no matter how far you are zoomed in. 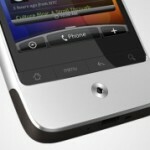 It also supports multi-touch pinch to zoom, a la iPhone. There’s limited Flash support too – Flash Lite – which performs OK, although the frame rate of Flash video isn’t great (read: choppy). Lastly, the Legend’s on-screen keyboard, like the Hero before it, works very well indeed and is, again, better than Android’s standard offering. Sadly, I didn’t get to really test out the camera or media-player capabilities, but they are likely to be on-par or better than the Hero and most other Android-powered phones. In terms of apps, you get access to the Android Market, which is improving all the time in terms of app quality and quantity. 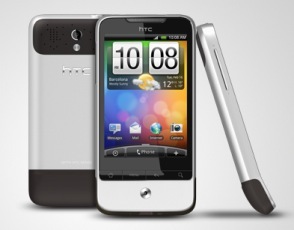 See also: Review: HTC Tattoo (vs HTC Hero) – Android’s mass-market future? If you don’t need a hardware keyboard, the Legend is our favorite Android phone to-date by a mile and is a superb iPhone alternative. That said, if horsepower is your top priority then you’ll want to also consider the HTC Desire or Google Nexus One, the latter comes sans-HTC Sense but is likely to get future Android OS updates sooner. Thanks for the review Steve; still waiting for more Android phones to roll out here in Beijing- though there's always the wonder if Wi-Fi is going to be ripped out of the handsets before they're released on the market here. Frustrating. Purchased my Legend 2 nights ago and love it. Its everything i expected from all the reviews and videos I've seen. Bought the phone through Telstra who have exclusive rights to it for the first few months. One thing that annoys me about that is that the phone appears to have their branding on it. Totally annoys the hell out of me. Want to remove it but I would most likely have to flash it. If you got a HTC Legend, http://www.htclegendforum.com would be helpful source.